Mindfulness is the ancient practice of noticing without judgment. Whether it is used as a gateway to higher spiritual growth or as a path to more balanced living, the applications of mindfulness are various…as are the ways to achieve it. 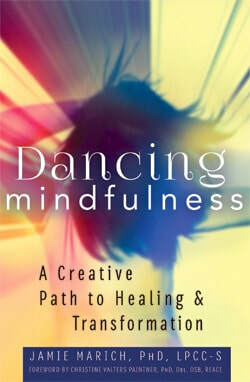 Dancing Mindfulness uses the art form of dance as the primary medium of discovering mindful awareness. Dancing through seven primary areas of mindfulness in motion: breath, sound, body, story, mind, spirit, and fusion (of all elements), with a respect to the attitudes of mindfulness, participants tap into their body’s own healing resources and realize that we all have a unique creativity just waiting to be cultivated! Explore our website to learn more about the impact of Dancing Mindfulness! Order your copy today wherever books are sold! Thanks to Expressive Arts Inspirations for this honor!